October 28, 2017, 9:30 to 1:30 p.m.
Can't wait to attend this inagural event! They've got a great line-up of writers, musical events, raffles and best of all, there's no admission. See you there! I'm excited to officially launch To Dream: Anatomy of a Humachine with a reading at the iconic Books & Books. Founded by Mitchell Kaplan in 1982, the store has become one of the most well-respected independent bookstores in the country. Food and drink to immediately follow. For all of you living away, the event will be live streamed! Sunday, September 18, 2016, 4 p.m. I'm excited to appear with my friends, the amazing writers Mike Creeden, Fabienne Josaphat, Cathleen Chambless, Rita Martinez and Michelle Jessica Fievre. We'll each be reading a short segment from our various works. I'll be reading, and participating in a Q&A with five wonderful writers: Jan Becker, Cathleen Chambless, M.J. Fievre, Fabienne Josaphat, and Laura McDermott. I'm honored to be the only male writer and am looking forward to discussing how I developed Pedal's female protagonist, Joanne Brick. This is a great treat for me. Not only is it my 1st appearance at the iconic Murder on the Beach bookstore, but I'm also appearing with my friend, the wonderful Nina Romano, author of the Wayfarer Trilogy. We're appearing together on a panel, answering questions as they're presented to us. I'll be at my assigned booth from 1-4 p.m. April 12 & 13. On the 14th, I'll also be at the Writer's Forum from noon to 3 p.m.
All 3 days I'll be showcasing my books, signing copies, and answering questions. This is the inaugural year for the Literary Festival, and I'm proud to have been asked to participate in it. Sunday, March 13, 2016 7 p.m. - 9 p.m. Doors open at 6:30. I'm excited to be appearing with Kathy Flann. She's a terrific writer and her new book, Get A Grip, is getting rave reviews. Saturday, March 5, 2016 - Welcome Reception at 6 p.m. In conjunction with ​Novel Day For Students, I'll be at the reception. It should be an exciting evening, as best selling authors Alafair Burke, Liz Cunningham, David Denby, Rebecca Dinerstein, Daniel de Visé, Helen Ellis, Deborah Harkness, George Hodgman, Michael Koryta, Kate Clifford Larson, Jason Mott, Steve Reddicliffe, Michael Riedel, B.A. Shapiro, Peter Slevin, Michael Springer, and Elaine Viets will be in attendance. Authors visit local schools as part of Broward County's literacy initiative called Novel Day for Students. I'm honored to be a part of this. I love speaking with students about writing. Sat. Feb. 20, 2016, 10:30 a.m. - 4:30 p.m. I'm excited to present Submitting with Success: Finding a Publisher or Agent. This is my method on how to submit work to publishers and agents. I've had three novels and over a dozen short stories and/or poems published. Along the way, I've picked up a few tips. I always look forward to sharing them with other writers. I'm thrilled to officially launch the release of Pedal with a reading at the iconic Books & Books. Founded by Mitchell Kaplan in 1982, the store has become one of the most well-respected independent bookstores in the country. I'm excited to discuss writing with members of OLLI @ UM, which is a continuous education series for those 50 and over. I'm pleased to be part of this amazing event which includes many authors and wonderful panels. I'll be reading and discussing writing at each location. Below is a complete list of my appearances. I'd love to see you there! Sat. Jan. 3, 2015 - 2 p.m.
Thurs. Dec. 11, 2014 - 7 p.m. Sat. Nov. 15, 2014 - 10:30 a.m. Sat. Nov. 8, 2014 - 3 p.m.
Wednesday Oct. 1, 2014 - 7 p.m. I'll be at the Free Comic Days﻿﻿ extravaganza signing copies of Die Laughing and giving away some cool stuff! It's an amazing day filled with comic creators, artists, cosplayers, comedians and of course free comics! Click HERE for more info. I'll be reading with some of the finest writers and poets in the area. Voted the best coffee house in Miami, Luna Star Cafe serves over a 100 different kinds of bottled beers. The event is free and a good time is always had by all. 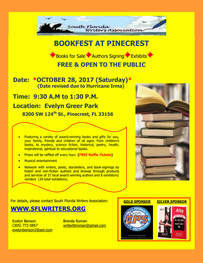 This is the place to mix with some of South Florida's finest writers. I'll be there signing copies of Die Laughing and answering questions about the book and writing. See ya there! I'll be reading with four of the finest writers and poets in the area. Voted the best coffee house in Miami, Luna Star Cafe serves over a 100 different kinds of bottled beers. The event is free and a good time is always had by all. Book signing time: 1-4 pm. Book signing time: 11am - 1 pm. I'll be at booth 24 in the Indie Press Area. It's a corner booth just below the celebrity signing area. Stop by - I'll be raffling off some nifty stuff- no purchase necessary! 6:30 pm Reading and Signing. Promoting your book panel discussion. August 27, 2011 - 7 p.m.